The LG K10 2017 runs Android 7.0 OS and can be powered with a 2800 mAh battery. 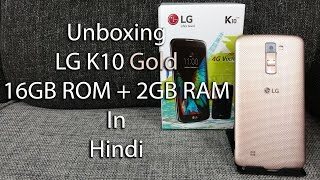 It’s a dual SIM Smartphone and connectivity choices on the LG K10 2017 comprise, GPS, HotSpot, Wifi, Bluetooth. The camera on the LG K10 2017 is a 13 MP shot Video Recording, with Auto Focus. The phone includes a 5.30-inch touchscreen display with a resolution of 720 pixels by 1280 pixels in a PPI of 277 pixels per inch. The LG K10 (2017) is powered by 1.5GHz octa-core MediaTek MT6750 processor as it includes 2GB of RAM.